BricktasticBlog. (2014). 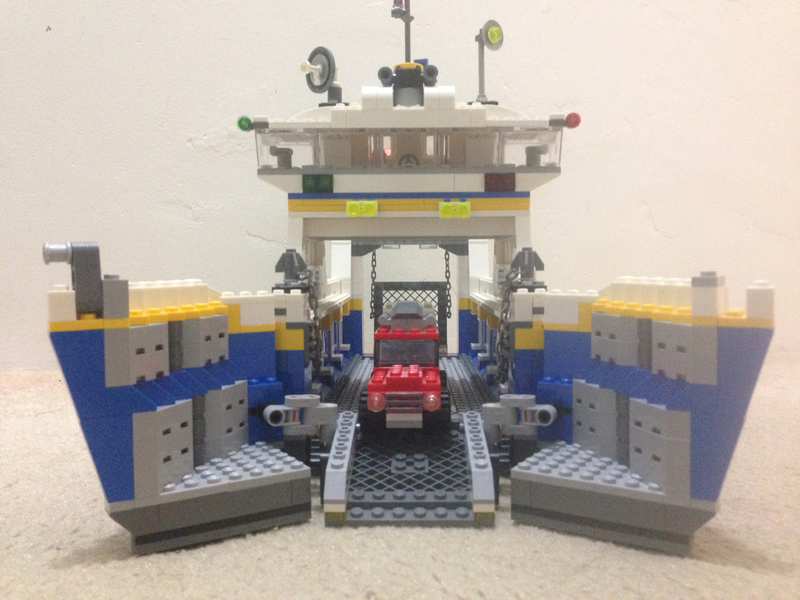 Transport Ferry & vehicle. I finally got round to building something! This set is an old school one from 2008, so it isn’t available from the Lego Shop any more. I got this from a mate as a result of our Lego Swap (see this post for more info). I’ve been hanging out to build it after seeing it at his place, and I was not disappointed! The box and original packaging wasn’t available, so he put all the parts in some other containers. It took a fair while to get the pieces ready, but that’s to be expected. I’ve linked the Brickset entry to the number above. As this is the first proper set review I’ve been able to do, this one will set the standard for all future reviews. If you want me to include anything, let me know in the comments! BricktasticBlog. (2014). Rear of Transport Ferry. 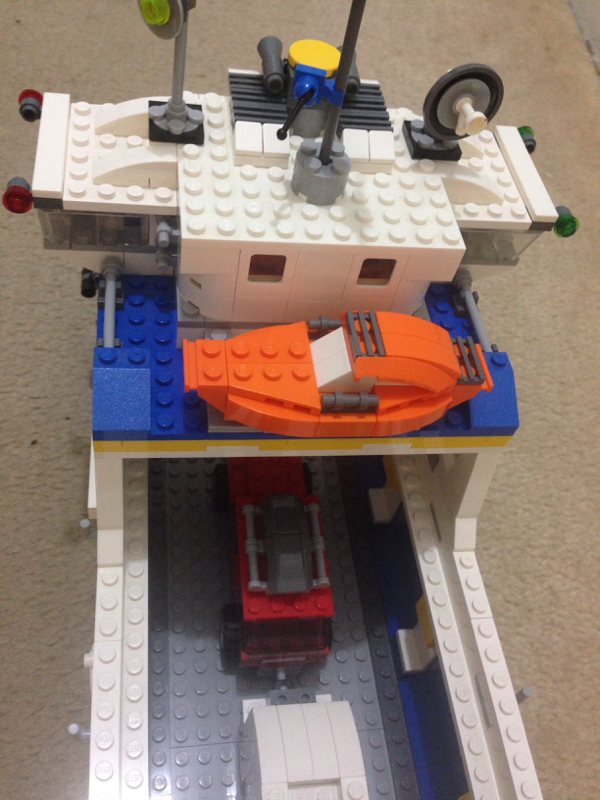 This set is a 3-in-1, so you’re able to build not only the Transport Ferry, but also a cargo plane and hovercraft. Both of these other models look pretty great! Unfortunately I didn’t get around to making the other sets, but I will do in the next couple of weeks. When I do, I’ll be sure to post some pictures. The set is made up of a number of colours, with plenty of white, bright blue, and medium and light stone grey. The beauty of this set is having access to loads of roof tiles, namely 4498154: Roof Tile 1x2x3/74°. This piece, although in a pretty wide variety of colours, bright blue is only in a small number of other sets. There are plenty of them, as they make up the bow of the boat. Other parts to note are: 4521664: 1×2 Plate with slide, 4299022: Grid Plate 8×8, and 4528851: Windscreen Inverted 2x4x2. The windscreen in particular is only in 7 other sets in various colours, of which the most recent set release year is 2010. If you can get your hands on this set, pick it up for the windshields alone! Other cool pieces include chains, a mini lance, and loads of plates of various sizes and shapes. BricktasticBlog. (2014). Top of Transport Ferry. The build itself is really good. Particularly clever is the mechanic for the front loading door. The front swing doors are connected to the grid plate, all of which are mechanised through some Technic parts. It ends up being a very smooth moving action. The back platform is much simpler, but neat nonetheless. The cabin of the ferry is built separately and added later, much like the Sydney Opera House is done. I’m pretty keen to add one of my LiteUp Blocks (see this post) to the cabin to see what it’s like. I’ll include it and post a picture later. The detail in the cabin is good. They’ve obviously put some thought into it! Little binoculars, and a simple control panel are really neat. It’s not overly detailed, but there is enough there. I love the little radar dishes on the cabin roof, too.They are really clever. BricktasticBlog. (2014). Interior of cabin. 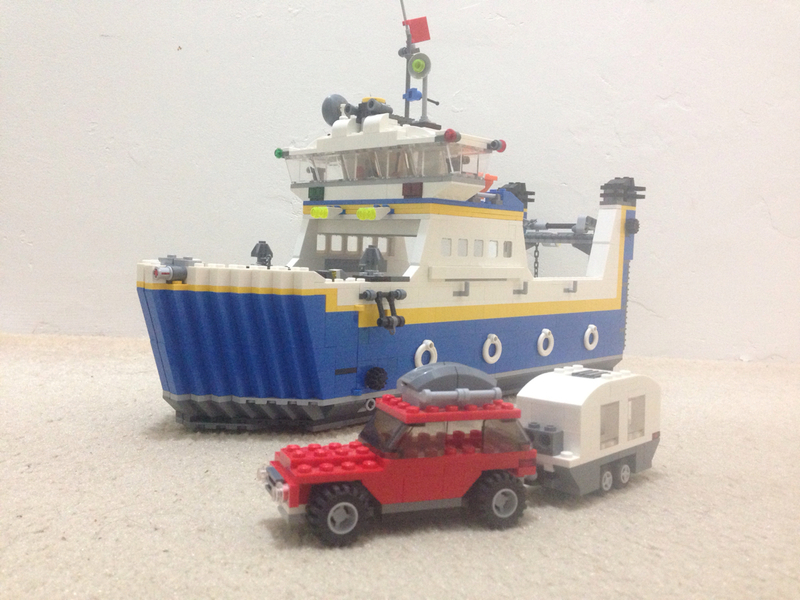 Also included in the set is a 4WD and caravan, and a little boat. The boat in particular is great. A simple build, but looks really effective! 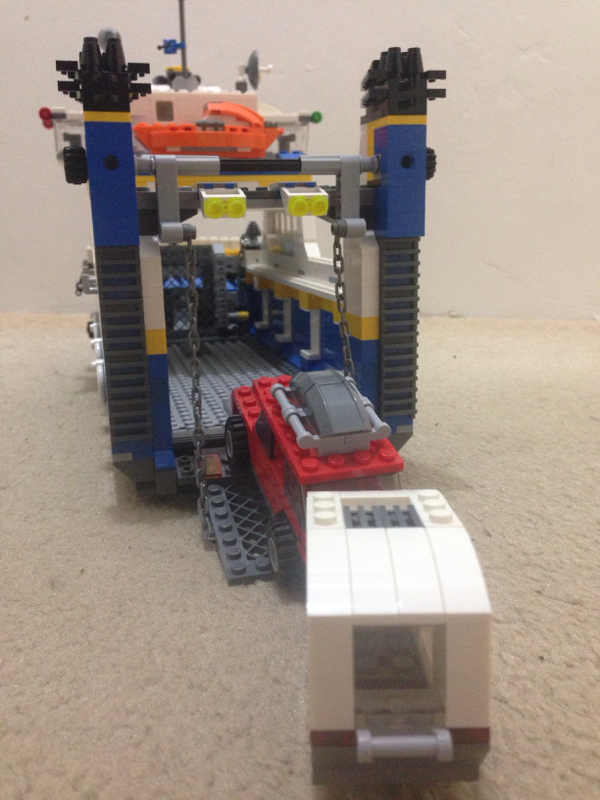 What would have been a good inclusion on this set is a crane to move the boat, but that can be added later with other matching bricks. One slight minor issue is the smoothness in moving the vehicles through the ferry. 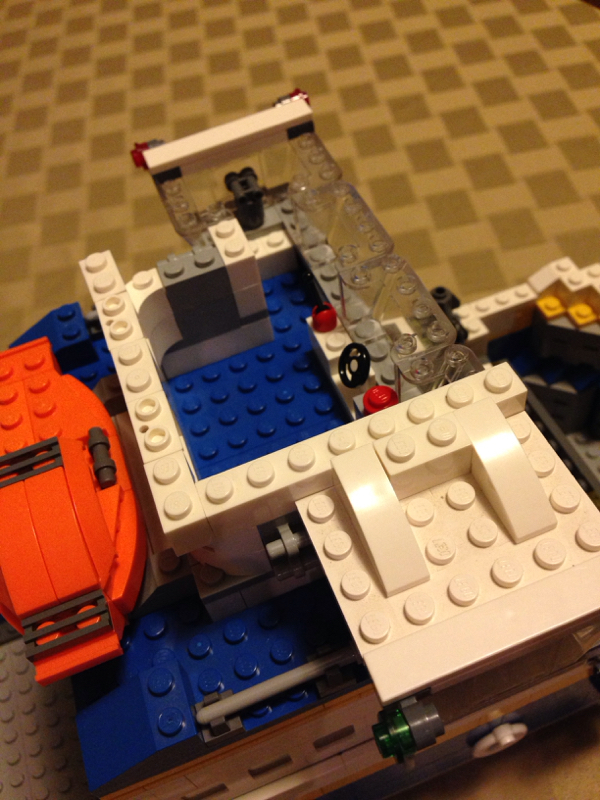 The rear loading platform isn’t too bad (aside from the boat not being very watertight), but the front is pretty rough. The tiny vehicle wheels have to roll over the cross axles, and get stuck. Having a smoother plate to roll over this would have been a good idea. The anchors on the boat are also a little flimsy. Having something with a little more strength would have been ideal. BricktasticBlog. (2014). Transport Ferry with front open. Overall, this set is a great one to have in the collection. The builds (the ferry at least) are good showpieces, and the parts are really useful to have in a collection (7 inverted windshields!). It’s a shame the set isn’t available any more – I’d love to own it! I’ll be sure to keep a look out for it on other markets. I’ll also be sure to take some better photos next time. Sorry about that. Next up on the review list is (when I get it) 10244: Fairground Mixer! There will also be a couple of smaller sets with it, but they will get reviewed separately. LiteUp Blocks: Let there be light!